In this rich collection of encouraging writings, E. M. Bounds, S. D. Gordon, Andrew Murray, and John Wesley thoughtfully explore a variety of topics, including the purpose and power of prayer, hindrances to prayer, the "how to's" of praying, and Jesus' habits of prayer. Lightly updated for modern-day understanding, this accessible book offers spiritual insight and challenge that spans more than three centuries. 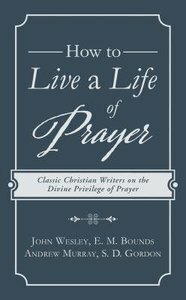 About "How to Live a Life of Prayer: Classic Christian Writers on the Divine Privilege of Prayer"
Edward McKendree Bounds (1835-1913), Methodist minister and devotional writer, was born in Shelby County, Missouri. He studied law and was admitted to the bar at 21 years of age. After practicing law for three years, he began preaching for the Methodist Episcopal Church. After the Civil War, Bounds served as pastor of churches in Tennessee and Alabama, and in St. Louis, Missouri. He spent the last 17 years of his life with his family in Washington, Georgia, writing his Spiritual Life Books. Some of these titles after a century are widely read like The Essentials of Prayer, A place called Heaven, Possibilities in Prayer, Praying with Purpose, and Power through Prayer, a number of these titles are also translated into Spanish. S.D. GORDON was a widely traveled speaker in high demand in the early 1900s. His quiet manner, simplicity, illustrative quality and gentle spirit won him a great following wherever he went. A prolific author, he wrote more than 25 books, 22 of which belonged to the "Quiet Talks series." His first book sold half a million copies over a 40 year span!